Are you ready to replace your missing teeth with dental implants in Asheville? That is great! You will make an excellent investment in your quality of life and your oral health. While you are excited to start your journey to a complete smile, Dr. John White understands you have some concerns about their cost. Although they cost more upfront than traditional options, they are more affordable long-term because they have over a 95% 10-year success rate. During your initial consultation, Dr. White will give you an estimate and discuss your payment options. 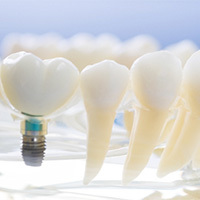 A single unit implant is more affordable than an implant-supported bridge or denture; however, it is more affordable than replacing each tooth individually. 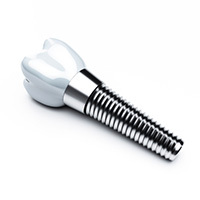 The types of posts and abutments used also affect the price, as well as whether your treatment should involve traditional implants or mini implants. There are discounted materials available to help lower the cost, but practices using these inferior materials could compromise the long-term success of your smile. In our practice, we use only the best quality materials from the most well-known dental implant companies. We want only the best for our patients! To evaluate your oral health and to create a customized treatment plan, digital x-rays and a CT scan are needed. It is not uncommon to need additional procedures prior to the placement of your implant posts, like tooth extractions, bone grafting, or a sinus lift. To promote a comfortable procedure, sedation or anesthesia are used. To help lower the cost of the treatment, your dentist in Asheville maximizes the value of your insurance policy. 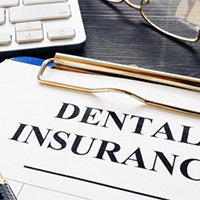 Although it will not pay for the entire procedure, it can be used for certain aspects of your treatment, such as tooth extractions or your restorations until you meet your annual allowance. To cover an out-of-pocket expense, CareCredit is also available. Based on credit approval, you are given the funds to pay for your treatment. You then repay the balance using a payment plan that accommodates your budget. Get a Complete Smile Today! Do not let the price of dental implants deter you from completing your smile. With the potential to last for several decades, they allow you to make a long-term investment. Contact our office today to see if dental implants are right for you.